There seems to be a popular belief in Denver that it almost always snows on the day that the goblins and ghosts head through the neighborhoods seeking sweet delights. Let's take a quick look through 58 years of weather statistics (1954-2011) for Denver to see if in fact that snow actually plays a role on Halloween. If you examine only October 31st...snow has only fallen 10 times (which includes trace amounts) during the past 58 years of which 8 of the days had measurable snowfall. This works out to be about once every 7 years or so or 14%. However...if you include the days that had snow on the ground on October 31st but no snow actually fell during the trick or treat times (5pm -8pm), you can add in an additional 10 times. Then...to this total..if you include the number of times snow fell on November 1st, this increases the total by 13, which will now bring the grand total of snow days associated with the period October 31 through November 1st to 33 times. Since this total equates to approximately 56 percent of the time during the 58 year period...more than half of the time...it is no wonder that people think of snow when Halloween is discussed in Denver. And if you add in the days when there was precipitation but no snow on October 31st...the total days comes to 41 which then tallies up to a whopping 70.6 percent! Click here for the latest forecast to see what the weather holds for this Halloween! 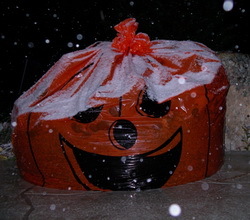 Just last year...2011...on Halloween...there was no snowfall recorded on Halloween and none on the ground. However just five days before, on the 26th, Denver had received 8 inches of snow and the following day, on November 1, we recorded 2.0 inches. The high for the last day of October was 71 degrees and the low was 40 degrees which equates to an average of 56 degrees. The average temperature during the trick-or-treat hours was a very comfortable 58 degrees. Snow was definitely upon us on the old witches and ghosts evening during 2004. Depending on where you were...snowfall amounts around northeast Colorado ranged from 0.3 inches at Greeley up to 14.5 inches at Aspen Park. The Denver International Airport reported 1.4 inches. As forecast...the area started off with rain around 6pm which then quickly changed to snow. By 8pm...only snow was falling. Here are some of the snowfall reports from around the Denver metro area: Bailey 7.0 inches... Larkspur 6.5 inches...Evergreen 5.0 inches... Aurora 4.3 inches...Chatfield Reservoir 6.9 inches...Thornton 2.8 inches... Lafayette 1.5 inches...Sedalia 10.0 inches...Jamestown 6.5 inches...Boulder 2.8 inches...Morrison 5.5 inches... Englewood 5.0 inches...Denver 3.7 inches...Castle Rock 6.8 inches and .Centennial recorded 8.0 inches. During Halloween 2002...Mother Nature turned on the winter machine and the trick-or-treaters marched through some snow as they collected their sweet goodies. At Stapleton Airport...1.2 inches of snow was recorded on Halloween with an average snow depth of 2 inches. As of 2002...this was only the 7th occurrence of snow in Denver on October 31st since 1954. Temperatures for the kiddos during trick-or-treat time was in the mid to upper teens. Snowfall was also recorded on the day before Halloween...2.2 inches and again on November 1st...0.6 inch. Previous to 2002...the last measurable snow occurred in 1989. There was a mixture of rain and snow early in the day before changing to all snow late in the day. A total of 3.4 inches of snow fell with another 1.1 inches on November 1st. In 1992...nearly half of an inch of liquid precipitation... 0.42 inch...fell but no snow was recorded because during the time period of the rain... Temperatures were just above the snow temperature threshold. Mother Nature played a real trick on the Denver treaters for Halloween in 1972. The high on that particular jack-o-lantern day was only 30 degrees and the low bottomed out at a very cold 15 degrees. Eight inches of snow was recorded on October 31st and to top that off... An additional 5.8 inches of snow fell on November 1st. During Halloween...2003...drizzle...light rain and freezing drizzle accompanied the ghosts and goblins. Some very light snow did occur across parts of the metro area but not at Stapleton International or Denver International. Average temperature during trick or treat time was 27.5 degrees. During the past 57 years...the average temperature during the time most kids are out (5pm-8pm) is 42.5 degrees. The coldest trick-or-treat period was in 2002...with an average temperature of only 18 degrees. The warmest trick-or-treat time was in 1990 with an average temperature of 63 degrees. In 1999...Halloween day turned out to be the warmest October 31st since we started keeping these Halloween statistics in 1954. But during the 5pm to 8pm time frame...1990 actually had a warmer average temperature with a 63 degree average compared to 59 degree average trick or treat temperature in 1999. That was 23 degrees warmer than the average temperature just one year prior in 1998 when the mercury averaged only a very chilly 36 degrees. The average high temperature for the last day of October is 59 degrees while the average low temperature is 31 degrees. Note: the temperature normally drops about 8 degrees from sunset until the time that the kiddos are collecting their treats.